x64 support in ESXi4.1 requires VT, I know that! but why warn so late? I know that ESXi 4.1 requires VT (the Intel support for hardware assisted virtualization) to be enabled to run x64 VMs. operating systems. However, 64-bit operation is not possible. This host is VT-capable, but VT is disabled. power-cycled since changing this setting. (2) Power-cycle the host if either of these BIOS settings have been changed. (3) Power-cycle the host if you have not done so since installing VMware ESX. (4) Update the hosts’s BIOS to the latest version. Following the link, you will see the page on the right. You are not authorized to access this Document. Why can’t it warn me upon installation? It helps x86 as well as x64, so an early warning would be very nice. Now you have to power down the machine (which might already be running a few x86 VMs), change the BIOS settings, then reboot. Why the error message in stead of more details? People not knowing about VT certainly need some extra explanation. In the mean time, I found out that one of my two HP XW6600 boxes had different BIOS settings than the other. 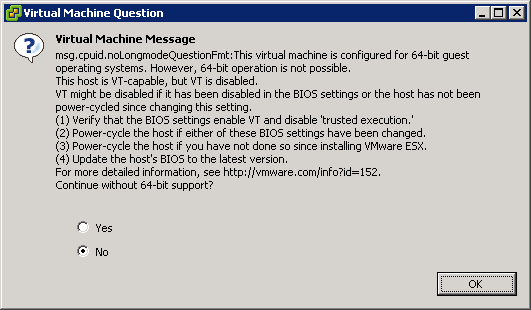 That was no problem for running Windows 7 Ultimate x64 on it, but ESXi requires the VT to be enabled. Note the HP XW6600 have been on the market long enough to use as a white box. It is not on the unofficual ESXi whitebox list yet, but I’ve been running it a while with ESXi 4 now, and just installed ESXi 4.1 on it, so I’ll blog about it in more detail later. 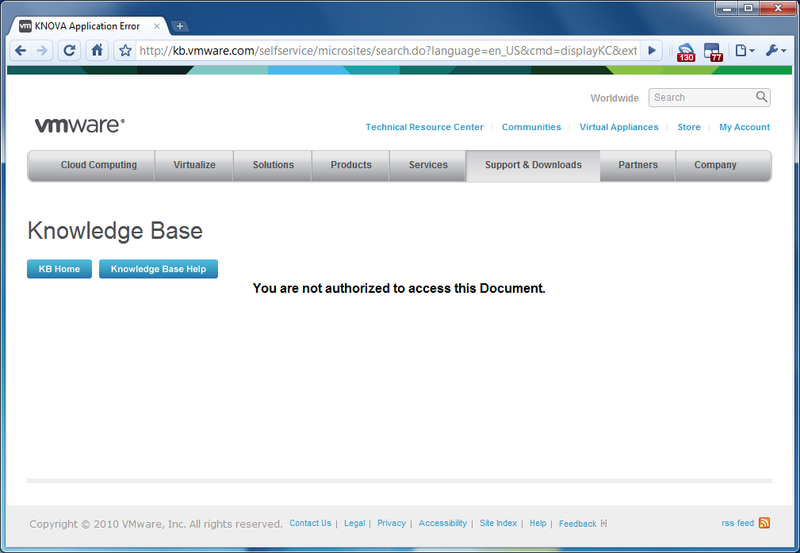 via VMware Communities: vCenter 4.1 in ESXi4.1 in Fusion 3.1? …. This entry was posted on 2010/08/16 at 06:00	and is filed under BIOS, Boot, ESXi4, Hardware, HP XW6600, Power User, Virtualization, VMware, VMware ESXi. You can follow any responses to this entry through the RSS 2.0 feed. You can leave a response, or trackback from your own site. How did you make it work with vmware esxi 4.1? Have you tried esxi 5.x? I enabled VT in my BIOS. I haven’t tried ESXi 5.x as at the moment of introduction it had severe memory limitations.